The department de La Libertad features a varied relief, starting from the coast line, passing though the highlands (Andes) de Otuzco, Julcan, and Santiago de Chuco, and ending in the upper jungle (The Amazon Rain Forest) at the border de the Department de San Martin. The coast enjoys beaches and fertile valleys that are very important to the national agricultural production. Trujillo, the capital de the department, is known as the city de eternal spring because de its blessed climate and festive atmosphere. 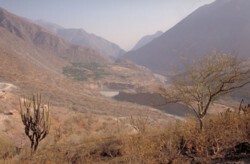 The area was inhabited by two important, ancient Peruvian civilizations, the Mochica and the Chimu, and later, it became an important vice royal city. Among its uncountable archeological attractions, there is Chan Chan, the largest mud city in the Americas and ancient capital for the Chimu. UNESCO placed it on the World Cultural Heritage List in 1986. There, you can see the remarkable huacas (pre-Incan sacred places) built by the Mochicas like the Huaca de the Sun and de the Moon, which measure more than twenty meters. Also, the El Brujo complex, decorated with inspiring figures de dancers and warriors. The city also has a splendid Colonial architecture where you will want to see the Cathedral, the Archbishop’s Palace, the Church de the Company de Jesus Christ, the monastery de El Carmen, and the many Colonial houses. The Huanchaco beach resort is only fifteen minutes away from the city. It is famous for the caballitos de totora, which are lightweight boats made de totora reeds that have been used to cut through the ocean since the time de the Mochicas and Chimus. There, you can enjoy exquisite seafood or simply bask in the glory de a day at the beach.